I'll be honest: I contemplated abandoning this novel many, many times. It's not that it's boring or drags in pace but rather that it simply was not the high fantasy YA epic that the hype had led me to believe. Dennard's debut series wasn't a favorite of mine--not beyond the first book, at any rate--but I still had high hopes for this series. But, let me tell you, Truthwitch is YA fantasy-lite at best, with meager world-building and a slew of rather familiar concepts. Obviously, my main qualm with this novel is the fact that its world-building is practically nonexistent. We have a multitude of countries who have signed a peace treaty--one which is coming to an end--and as the treaty has not been renewed, war is brewing just around the corner. Why these countries were at war in the first place is unclear. As is the individual politics of each nation, the mannerisms and culture of every country, and the general political scheme at play. The plot revolves entirely around our heroine, Safiya, who is a Truthwitch--rare and coveted witches able to discern truth from lie. In this time of political turmoil, Safiya could be a dangerous weapon in the hand of any politician and, as such, she is whisked away to safety with the help of her best friend and Threadsister, Iseut. What a Threadfamily's significance is and why everyone doesn't have one is something I can't tell you because, you know, lack of world-building. Safiya is hot-headed and irrational, the type of heroine who acts first and thinks later. It's not quite grating but...it kind of is. Iseut, her opposite in every way, is calm and cool, able to see the threads that bind individuals and display emotions. While both girls are extremely different, I was unable to really become invested in either during this first half. I found Safiya cumbersome and I found Iseut inscrutable. Combined with the poor world-building and the inclusion of secondary characters I felt absolutely nothing for, it is a surprise I continued with this novel at all. But, the second half of this novel picks up tremendously. We are introduced to action sequence after action sequence, which keeps us on the edge of our seats, and, what's more, I finally grew to care for these characters. Safiya undergoes a fair amount of growth in the second half of this novel, which I appreciated, and though Iseut grows more and more mysterious--turns out Safiya isn't the only "special" one here!--I also found myself able to understand and relate to her far more than I could originally. It helped that the secondary characters really begin to shine in this last half, too, becoming individual personas in their own right. Adeuan, the Bloodwitch hunting Safiya and Iseut, is utterly fascinating and I desperately want to learn more about his backstory. As far as villains go, he's rather remarkable. Prince Merik, chartering a ship that holds Safiya and Iseut, is further thrust into the spotlight as our romantic interest. While the romantic tension between him and Safiya often plays out rather childishly--endless bickering!--I warmed up to them by the end. Now, that's not to say that their romantic arc is well-plotted, because it reads rather like insta-love in some parts, and further I find that Merik's personality is composed largely of his concern for Safiya but, I have hope that their relationship will be explored and develop much better in the sequels. Unfortunately, the world-building doesn't improve in the second-half but it does expand and thought Truthwitch has had a lot of flaws for me, the second-half of this story was thoroughly enjoyable and I am definitely planning to pick up the sequel. 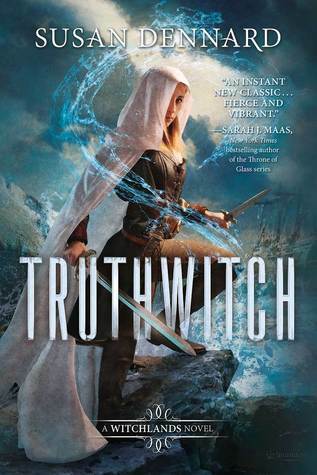 For fans of high fantasy, YA or Adult, Truthwitch isn't going to impress. If, however, you're looking for a novel to get you into the first forays of fantasy or simply enjoy the fantasy-lite that YA is known for, then this is exactly up your alley. It has ball gowns and sea monsters, magical powers and dizzying kisses. At its core is a strong female friendship and a journey of growth and development. It isn't the political novel I wanted it to be but, nevertheless, give it a shot. It just may surprise you. I don't really read a lot of fantasy novels, so I might be okay with this one. I'm sorry it wasn't quite what you were hoping for, though. It sounds like the second half made it mostly worthwhile! So many people have loved this book. It's been nothing but hype and love for this on Twitter. So I have ordered it from my library to see what the fuss is about, I'm glad to see a average review, and isn't quite perfect for everyone. Lovely review! With everyone loving this one, I was surprised at first you didn't like it from the start. I was thinking that perhaps this one wasn't for me until I read the second half of the review. *whew* I am an ending girl so if it ends strong and I know it will get there, then I'm good. Brilly review. I'm so sorry you didn't like the beginning of the book but I'm glad you liked the second half so much. Lol, it's not like I wrote it but I loved this novel! I'm glad you want to continue with the series. Excellent review! The only fantasy-lite series that I've enjoyed in the past is that of Melina Marchetta's Lumatere Chronicles. While it has a multitude of kingdoms, I thought that each one's culture was discernable than the last. Of course, Marchetta is a wiz at words, so it's not very hard to love her books. Anyway, I did hear a lot of talks about how confusing Truthwitch is and how the story is told through a whole slew of perspectives. I honestly would not have the patience nowadays to pick apart each thread. Seems very time consuming. Lol. Great review, Keertana! Actually I think your main issue with this book (lack of world-building) probably wouldn’t bother me as that much. I’m not a big fan of high fantasy political novels. I love a remarkable villains and this one sounds good, and female friendship. Maybe I’ll wait for the next release in this series. I'm so glad that despite the rough start you had with this one that it ended on a high note Keertana! I've been hesitant to pick it up because it has gotten so much hype and that always makes my expectations impossibly high, but I'm so glad to know this worked for you overall. The lack of world-building seems to be a theme with YA fantasy lately, but if something else makes up for it I'm usually good to go. I'm thinking the second half will be that something. Gorgeous review!